Great Start … But Is It A Record? 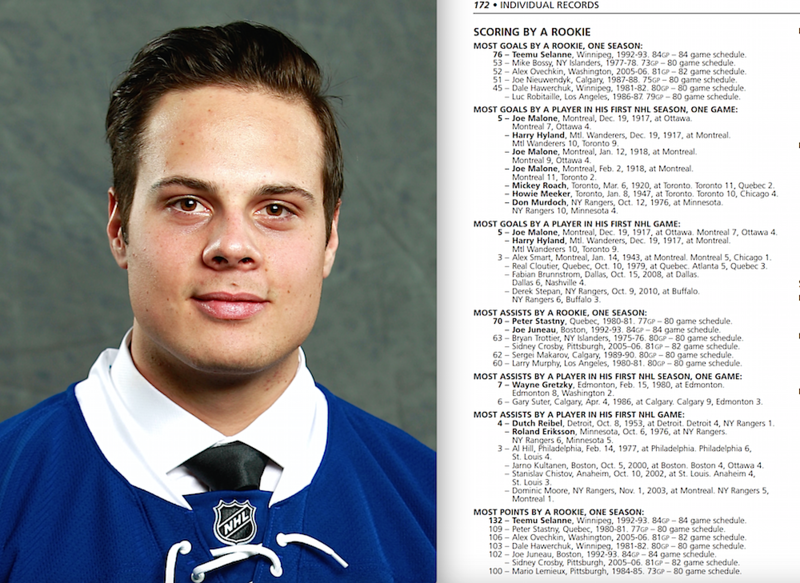 Toronto Maple Leafs rookie Auston Matthews scored four goals last night in his first NHL game. It’s pretty amazing! (Although marred somewhat by Toronto’s 5-4 loss in overtime to Ottawa.) So, was it an NHL record? That’s not as straightforward as you may think! The confusion probably goes back to the 1979-80 season when the NHL didn’t want to consider Wayne Gretzky a rookie because of his one year as a professional the season before in the World Hockey Association. Gretzky had 51 goals, 86 assists, and 137 points that season. His 51 goals would have been two short of Mike Bossy’s then-rookie record of 53 … but his 86 assists and 137 points should have been records. They still should be, but instead, you’ll see those ROOKIE records are held by Peter Stastny, Joe Juneau (70 assists) and Teemu Selanne (132 points). The records Gretzky is credited with for the 1979–80 season are all records for A PLAYER IN HIS FIRST NHL SEASON … but not rookie records. It can certainly get a bit confusing! For years, the NHL listed the record for most goals by A PLAYER IN HIS FIRST NHL GAME as 3, first by Alex Smart in 1943, and then, more recently, by Real Cloutier, Fabian Brunnstrom and Derek Stepan. Unfortunately, I don’t have NHL Guide’s going back far enough, but my guess would be that before Cloutier (who, like Gretzky — but with even more years — was a WHA veteran) this was actually listed as a rookie record, but ever since I’ve been working on the Guide the wording has stated FIRST GAME and not ROOKIE. There has also been a record for MOST GOALS BY A PLAYER IN HIS FIRST NHL SEASON, ONE GAME that for years was shared by Howie Meeker and Don Murdoch. But then, beginning with the NHL Official Guide & Record Book for 2010-11, we added the much older five-goal games by Joe Malone, Harry Hyland and Mickey Roach during their first NHL seasons. Since Malone and Hyland had both scored 5 goals in the two games played on the very first night in NHL history back on December 19, 1917, we had to add them to the record for most goals by a player in his first NHL game as well. Given that the rule book already had a distinction between rookies and first-year players, how could we not? Stories from The Toronto World, December 20, 1917. Summaries from the Toronto Star of the same date. Malone and Hyland had both been pros, playing in the highest leagues of their day, since 1908. So, it’s certainly hard to consider them NHL “rookies” in 1917-18. Still, given that it was the league’s first season, there’s no denying that they each scored five goals in their first NHL games. So, technically, while Auston Matthews seems to have set a rookie record last night, it’s not a record for a player in his first NHL game. But it’s still a pretty impressive debut! And if you check the summary above, you’ll note that Reg Noble scored four goals for Toronto against the Wanderers in that December 19, 1917 game. So, it looks like we’ll need to add that to the list along with Matthews for next year. Interesting how contorted records can be…all of these players played professionally before being in the NHL…including the latest newbie, Matthews. In my books, Gretzky was the highest scoring rookie to date in the NHL…rookie=first year player=FACT. Maybe the NHL will allow the official records to be updated someday to reflect what really happened. Nice find Eric about the four goals for Noble to add in the next Guide edition with Matthews. But if you look carefully at the summary above, I think you’ll also have to add Cy Denneny for his three goals for Ottawa against Montreal along with Smart, Cloutier, Brunnstrom and Stepan! Yeah — unfortunately it gets more and more confusing with OT and shootout wins and losses etc. Great job of researching — love these stories. Way to go Austin!! I am going to start watching more hockey for sure!! !